This tutorial was written for Woocommerce 2.1.12 on a WordPress 3.9.2 installation. Today we’ll be strolling down a little lane called Woocommerce as it functions in the administrative area of WordPress. We’re not covering theming, extensions, or anything like that, simply the down and dirty basics of how Woocommerce works as far as creating, selling and managing products, and how to handle orders. This is where you manage your orders, among other non-product related items. 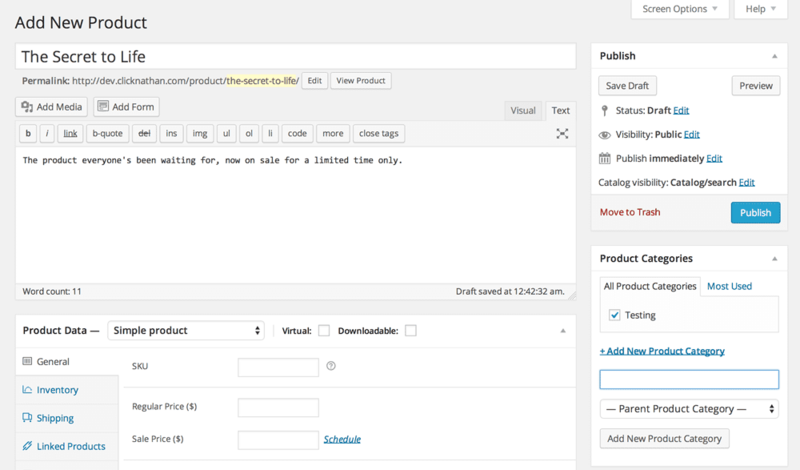 Click Woocommerce in WordPress to bring up the orders screen. Tick any orders you’re ready to process, trash or complete, and then use the Bulk Actions button to change their status. Order statuses are primarily to help you know where each order is at, and are not automated. So, when you actually ship something, you can mark it as complete. Woocommerce doesn’t know if you went to the post office or not. You can also use the icons to the right of each entry to mark an order as complete (the checkbox), or view all of the details about an order (the eyeball). Most of the icons on this page will give you more information if you hover over them. You can also sort by date, status and customer name using the dropdowns near the top of the list. Click the Coupons link in the left navigation. Here you can setup coupons, and I already have a complete guide to doing so here. A cavalcade of reports to help you understand how your online store is performing. This is all very self-explanatory, but I personally find the Sales by Product reports to be the most useful, as they show you what products are performing the best in your store, and give you insight into what you might want to focus on. Coupons by date is another handy one, giving you an idea of which promotions are being used the most. The countries you are willing to sell to can be controlled via the Selling Location(s). You can quickly choose to sell to all countries (which will have implications with the shipping provider you use and how that section is configured) or start typing the names of specific countries you’re willing to sell to in this area. The Store Notice text is useful if you ever need to broadcast a message across your entire store, like “There will a 2 week delay in processing all orders beginning November 22nd, 2014”, etc. Under Add to Cart, you can tick “Redirect to the cart page…” if you want people to be automatically taken to their cart after they choose a product. Useful if your store tends to only sell one thing at a time, but if you want them to shop around keep this unchecked. If you change any of the dropdowns in Product Data, you’ll need to go back through all of your products and update their weights and sizes. You can turn off ratings and control who can leave a rating in this section as well. If you edit anything in the Product Image Sizes, note the text there which explains what you then have to do to get old products images to look right. There are also controls for handling digital downloads, though if you’re working with digital goods only I might recommend you take a look at Easy Digital Downloads, a much simpler plugin for that type of store. You can easily toggle tax calculations on or off here. This section is largely editable safely, and you should speak with your accountant or whoever handles your taxes to see which settings are applicable to your business. Again, this is not a tutorial explaining how to get this type of stuff setup, but how to use it once it is (ie, if I or someone else set it all up for you). The main thing you can edit in this area is the order that the various payment options show up during checkout. So if you have 2 or more options for your customers to pay, you can simply drag and drop them in the list at the bottom of this page. As with Checkout, you can drag and drop shipping options in this list if you want to reorder them on the front end. In the Shipping Destination area, you could also force shipments to go to the billing address of the customer, though this will be annoying to some customers and lose you sales. This is one area where you can go to town customizing the text of the various emails Woocommerce generates when people place an order, receive an invoice, reset their password, etc. The first page of this area also allows you to change the colors of these emails and who they are sent to (when an admin is notified). After the Orders screen, this is probably the most used aspect of Woocommerce. You can click directly on the Products tab to see a list of all existing products, and then click the name of any of them to edit them, or click Add Product to create a new product. Let’s walk through all of the sections in these Product editor screens. The first field is where you enter in the Product Title, aka the name of the product. The large box below is where you add the full description of the product. In most themes this will be displayed in a tab near the bottom of the product page, and won’t be the first copy a potential customer sees. This is for the most basic of products, ie those that have no options such as size or color to choose. This allows you to create one product that is actually comprised of several other products, so you can create bundles, such as a set of five different mugs that, when purchased together, are cheaper. This allows you to link the product to a third-party store, such as Amazon, so you can make a commission on sales you refer. This is for products that have options, such as a t-shirt that comes in various sizes and colors. Most of the fields in this area are self-explanatory, or you can hover over the question mark icon to get more information. Linked products bears mention, as it allows you to link this product to other products, in an attempt to get customers to purchase more items. When working with a Variable product, to get the options to show up where you can enter in data for each of the different variations, there are several steps you’ve got to take. You’ll be taken to a similar screen, and just as you create Categories and Tags for Posts, you can begin to create the terms for this attribute. So you may have a Size attribute and the terms within it are Small, Medium, Large. Once you’ve configured all of your attributes, head back to the Product’s edit screen (you’ll have to save it as a draft or update it to see the new attributes) and into the Attributes panel. Choose your attribute from the dropdown that reads “Custom product attribute” by default, then click Add. You can then click Select All or begin typing in terms from the attribute, if you only want to use some of the terms from that attribute on this product. You can add one or multiple attributes, so you could have Size and Color, for example. Click Save attributes when you’re done. Next, click the Variations tab. The first thing you’ll do in this tab is click Link all variations. That will create one entry for every possible combination of attributes, up to fifty. Once you do that, you can go in and edit the price for each item (ie, an XL shirt might cost more than Small, Medium and Large shirts, or a rainbow mug might cost more than a plain red mug). You can also use the Choose a field to bulk edit… dropdown to make life a little easier on yourself. Update the post and you’re all set. Moving on to the rest of this page’s options, the Product Short Description is what’s shown next to the product image in many themes, and the first text customers will typically see. On to the right column, you can categorize and tag Products similarly to how you can do so with Posts. It’s always a good idea to set the product image. Just click Set Product Image, upload an image, and click the Set product image button. This will be used for the thumbnails on the main store pages, as well as the large image on the Product’s own page. You can also click Add product gallery images to create a gallery to compliment the primary image. That more or less does it for your Woocommerce walk through! Hopefully you’re feeling a little more comfortable with what can, at first, seem like a daunting system but as anyone who uses it for awhile knows, is about as simple as e-commerce comes.